Audrey Woodhams is a Dove Award-nominated songwriter with more than 1.5 million sales worldwide. She releases her fifth independent album, A Thousand Different Colors, following four years of writing, teaching, and building creative communities in Zurich, Switzerland. The subtle girl-with-a-guitar musicianship [is] an ideal foundation for her gorgeous expressions of praise. A graduate of Belmont University School of Music, Audrey Woodhams (then Audrey Hatcher) quickly caught the attention of the Nashville music scene. She released her first album, 1553 Delmar, to a full house at Nashville’s legendary Exit/In in 2001, and became a staff songwriter for the Gospel Division of BMG/Brentwood Benson Music Publishing. In an honest moment of prayer, Audrey penned “All My Praise” which Dove Award winning trio, Selah, featured on their 2004 album, Hiding Place. The song spent 5 weeks at #1 on the Inspirational Radio Charts and climbed to the Top 10 on the Adult Contemporary charts. By 2006, the song earned Audrey her first Dove Award nomination for Best Inspirational Song of the Year and was included on WOW:2006, 30 of the Year’s Top Artists and Hits. Even in the shadow of death, I will praise you. Holy, my God, You are worthy of all my praise. In March of 2004, Audrey provided fans a seven song CD entitled Unreleased featuring her solo version of “All My Praise” and the must-sing-to praise song “Surrounded,” produced by Joe Mazza (Nathan & Christy Nockles, Ginny Owens, Little Big Town) and Jimmy Collins (Matthew West, Plumb). Later that fall Audrey delivered such an exceptional set to 3,000 enthusiastic students in Wheaton, IL, the recording easily became her third album, Audrey Hatcher: Live at Wheaton College. The year 2006 brought personal and professional milestones, as Audrey wed biologist, Doug Woodhams, and released her fourth album, Mysterious You. Presented in her signature acoustic folk/rock sound and produced by Steven Leiweke (Margaret Becker, Sara Groves, Jars of Clay), Mysterious You features congregational worship songs “Spirit Move” and “You’re Beautiful.” Christianity Today gave the album four stars, saying “beautifully crafted lyrics and subtle but striking musicianship make Mysterious You a standout effort.” Read more. 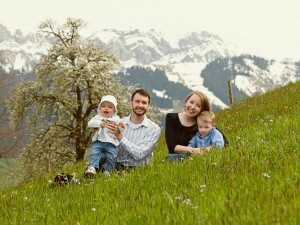 The Woodhams family moved abroad to Switzerland in 2008. For four years, Audrey traveled the European landscape, writing, performing, and teaching. She brought international artists together in community as Creative Director of ICF International Church in 2009-2010, and founded The Living Room creative community for local artists in 2011, even as her family grew. Currently based in Boston, Masachusetts, Audrey is a mother of two. She enjoys Real Simple Magazine, cooking, and exploring the New England countryside.